Well, this weekend turned out quite nice. My friend Paula of "Paula's Garden" and I, along with my two little gals went to the big garage sale event in Lincoln and then BONUS! I was able to go to the auction in town here, too! I will share some finds this week. In fact, today's post is one of them. I picked up a box of piano keys, how cool, right?! I will be selling these because I already have a box of them from this project. But, don't think starting a piano key collection didn't cross my mind....fill a wall with piano keys....could be soooooo neat! 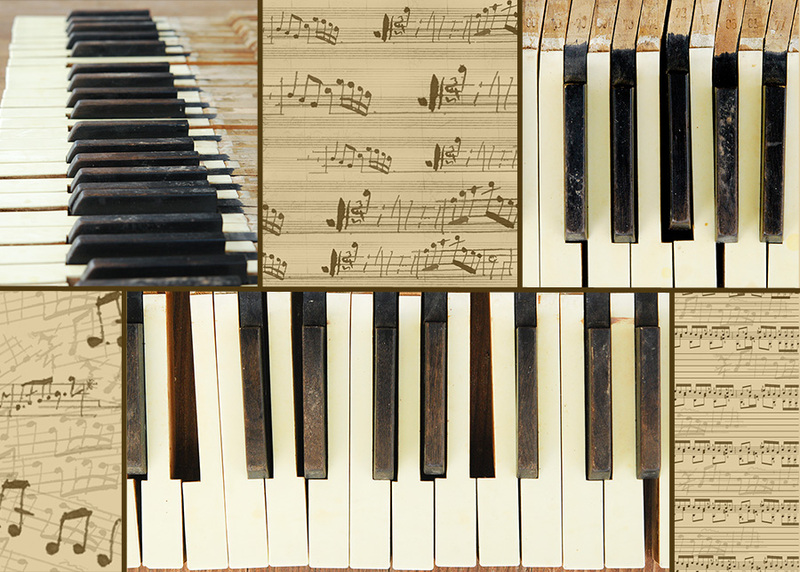 Interested in piano keys? Email me to work out the details. I'm not sure how I plan to list them. As is? or with the top wood cut off so the keys could all fit together snuggly? This isn't a full set, and I think there are actually duplicates in this grouping. Free photoshop music brushes can be found here and here. In my opinion - you can't have to many piano keys!!! LOVE IT!!! I'm glad you had a wonderful "junkin'" week-end! Great Mosaic! Can't wait to see your finds. I have NEVER seen piano keys for sale or auctioned. Who decides that they will demolish a piano and sell the keys? Need to go check your link and see your project. I need a visual on this one! heehee. wow- love the piano keys- would love to have them but already have too many collections - but they are cool! I'm looking forward to what you got at the garage sale event and the auction! Piano keys - how fun. I can't imagine what to do with them, though, although if I thought about it, I know something would come to mind. Lovely mosaic - I do love music (both the sound and the writing). What a cool find!! I've never thought about what I'd do with piano keys. Love your mosaic, you could frame that and it would make a wonderful art piece. How interesting! Someone will be thrilled to read about this opportunity. Piano keys...gives a whole new meaning to "brushing up the ol' pearly whites"! Love your blog! I look forward to reading more! I really like this. The sheet music, the keys. I also like mosaics. Beautiful.